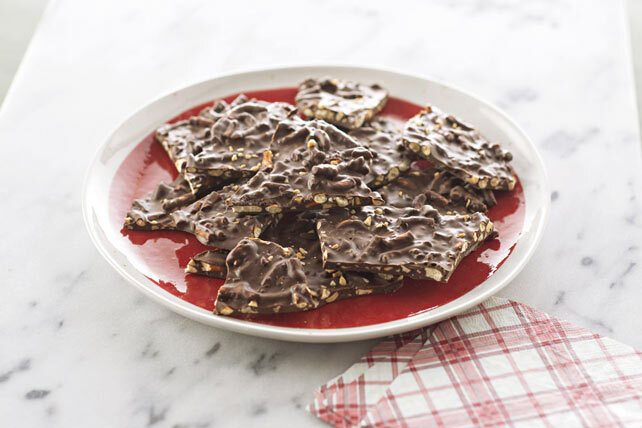 If you can melt chocolate, you can make this scrumptious Sweet & Salty Bark. Loaded with crunchy peanuts and pretzels, it's the perfect gift any time of the year! Microwave chocolates in medium microwaveable bowl on MEDIUM 1-1/2 to 2 min. or until almost melted, stirring after 1 min. ; stir until completely melted. Add pretzels and nuts; mix well. Spread onto waxed paper-covered baking sheet. Refrigerate 1 hour or until firm. Break into pieces. Melt 2 pkg. (170 g each) Baker's White Chocolate. Combine with 1/2 cup each dried cherries, chopped dried apricots and chopped pistachios. Stir in 1 tsp. orange zest. Spread onto prepared baking sheet and continue as directed. Melt 2 pkg. (170 g each) Baker's Bittersweet Chocolate. Combine with 20 chopped chocolate wafer cookies, 1/2 tsp. cayenne pepper and 1/4 tsp. ground cinnamon. Spread onto prepared baking sheet and continue as directed.